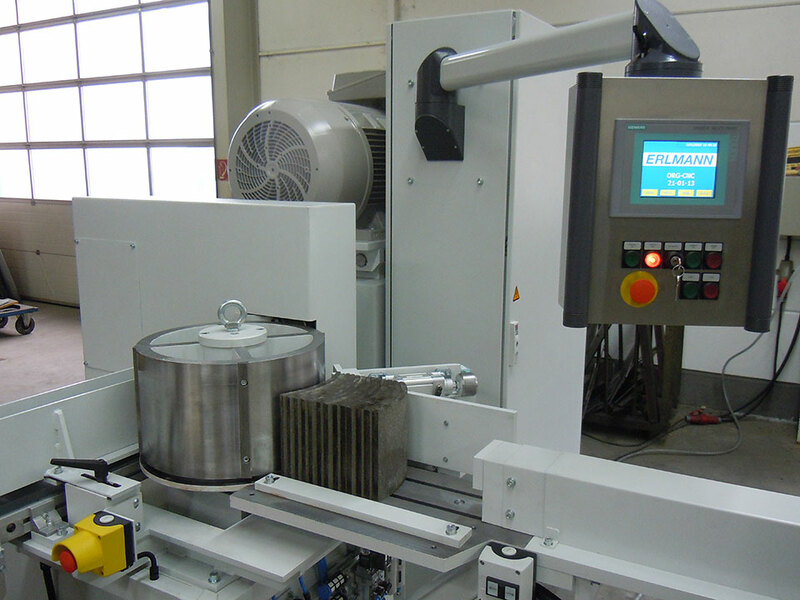 The machine is designed to accurately grind the outside radius of brake blocks to true radii according to OEM-specification and based on ROWLAND design. Brake blocks can be parallel or taper curved. The machine is run by one operator who stacks blocks in a magazine. Ground blocks exit to short rails. Grinding of up to 900 blocks per hour can be achieved. 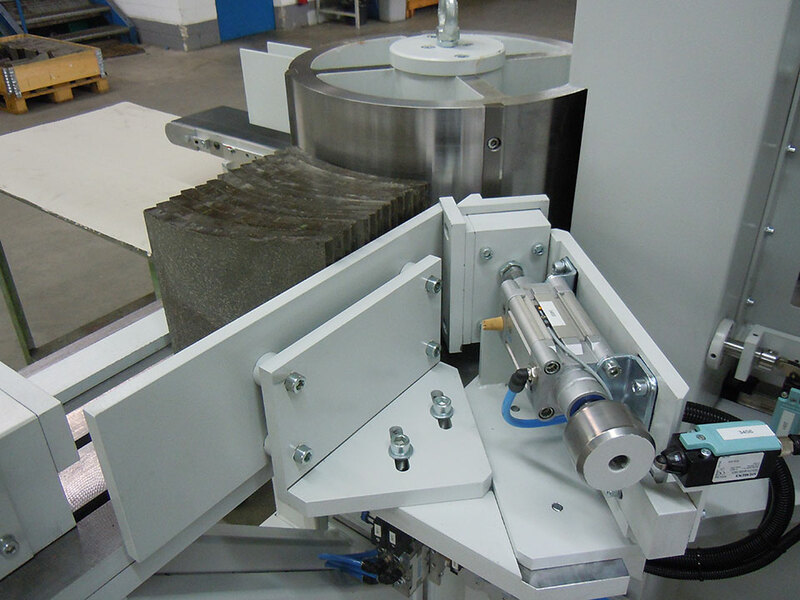 This machine has been developed to meet the demands of Brake Block Manufacturers to produce parallel and taper curved brake blocks, even in small batches. Ability to grind taper and parallel blocks from a simple low cost cylindrical fixture drum made to the inside radius of the block. One fixture drum can be used to grind any product reference with a matching inside radius and so fixture costs are greatly reduced. Each programmed tool segment can be quickly given offset values to improve tolerance range, which eliminates problem of manufacturing tolerance accumulation for different tool segments (as usual on traditional fixtures). Grinding setting data stored in machine. Improved change over time, tool changes only required when changing to another inside radius. The machine is equipped with semi-automatic loading. Brake blocks are hand loaded into the magazine. These blocks are pressed against the constantly rotating fixture by a low pressure air cylinder, mounted in the magazine loading escapement assembly. The brake blocks are stripped from the magazine by drive dogs on the rotating fixture. Blocks are held against the fixture by pressure from a pneumatic loading pad prior to the grinding wheel. 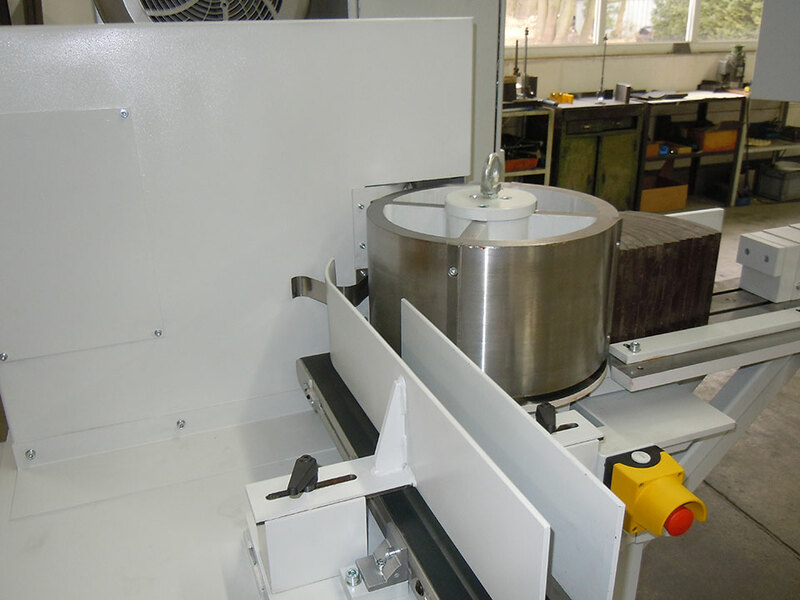 As standard the machine utilizes a 760 mm diameter diamond grinding wheel, driven by a 45 kW drive motor. Life of diamond grinding wheels is naturally improved by the oscillating nature of the point of cut when grinding taper linings. The grinding spindle is mounted on heavy duty bearings to ensure long bearing life and high accuracy of components ground over an extended period of time. The spindle has double angular contact bearings at the front and a roller bearing at the pulley end. The grinding head is mounted on precision skates and guide rails and is moved to the required grinding position by a digital servo motor and precision ballscrew. The head is fitted with a homing switch for positioning on start up and has safety switches to prevent overtravel and collision with the work fixture. 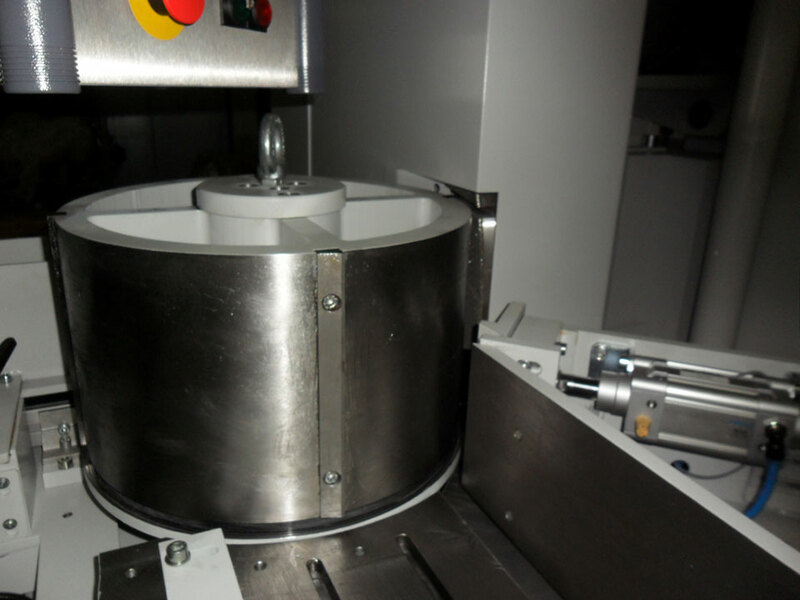 The fixture spindle runs on AC bearings at the top and a precision ball bearing at the bottom, rotation of the spindle is controlled by Digital Servo Motor with position feedback used to control the position of the grinding head. Blocks are located on circular fixtures which are matched to suit the inside radius of the linings to be ground. The fixtures are quick to change and locate on a precision parallel keyed spindle. Each fixture can grind both parallel and taper linings by selecting the appropriate program from the control. 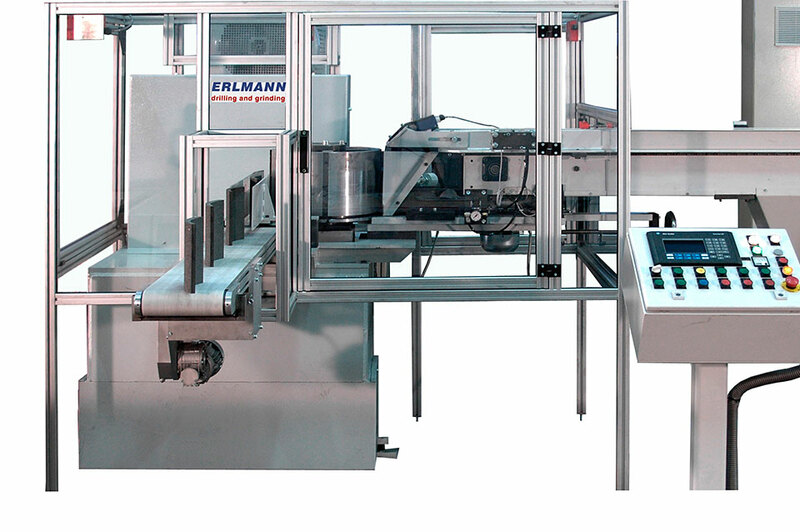 The machine is suitable for removing a maximum of 2,0 mm of material when a block is passed through. Brake blocks are ground on the flat face of the grinding wheel. As standard, grinding takes place on the right hand annulus of the grinding wheel when viewed from the front of the machine. Wheel wear on the grinding wheel is carried out evenly as the point of cut moves across the wheel face. 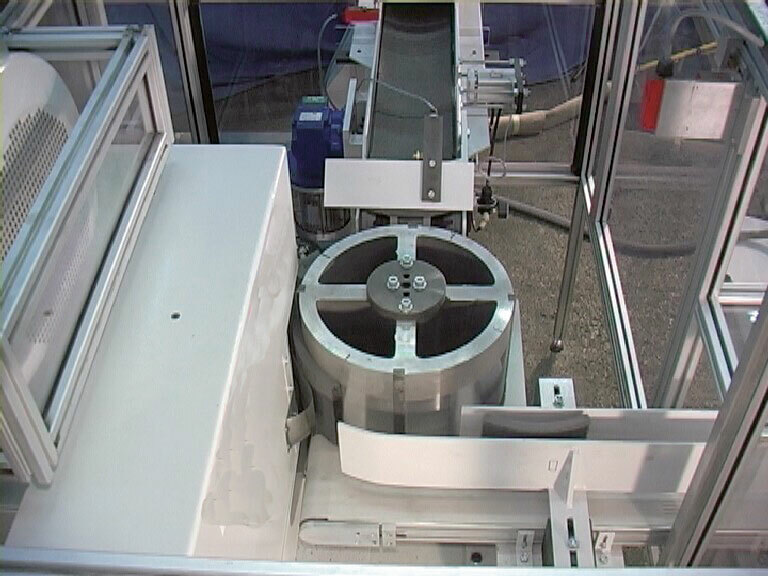 The positions of the grinding head and fixture drum are controlled by powerful digital servo motors. Both, Parallel and Taper blocks (Cam and Anchor) can be ground on plain radius drum fixtures matched to the inside radius of the block. When grinding parallel blocks the head moves to the radius of the block to grind the block to the correct size. For taper blocks the head adjusts position relative to the angle of rotation of the fixture, producing a taper block, mounted on a circular fixture. After grinding blocks are automatically stripped from the work fixture and ejected on short rails for feeding to optional systems (like output conveyor, automatic stacking, automatic loader for incorporation into conveyor fed line, etc.). The machine is equipped with an SIEMENS S7 PLC unit. Conventional buttons are fitted for normal operation with a digital operator interface screen for selecting parts to be ground and setting and entering block information. Memory for storing 256 block references is provided. 4. Manual control of grinding head position and magazine loader. 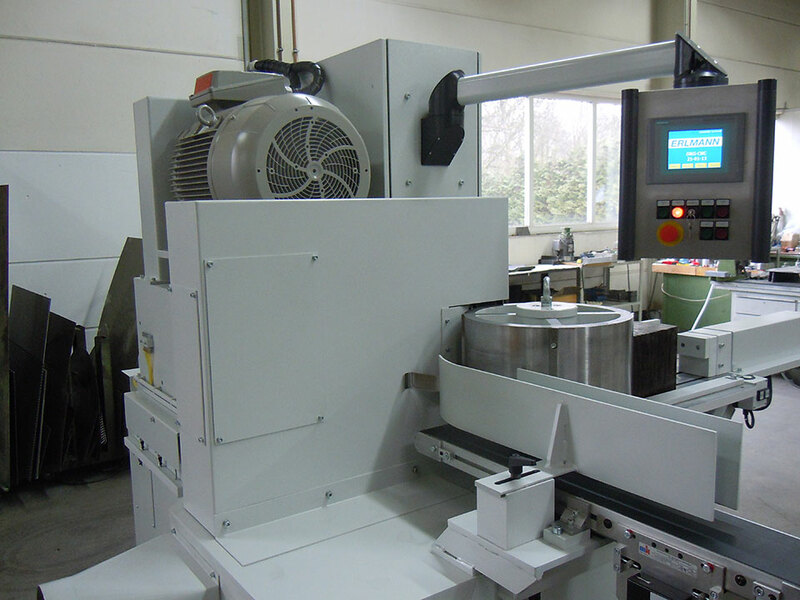 The machine has been designed for use within the Friction Material Industry. Special care has been taken to obtain effective dust extraction efficiency. The machine is supplied with a full set of dust guards and extraction nozzles, ready for connection to customer's centralized dust extraction system.